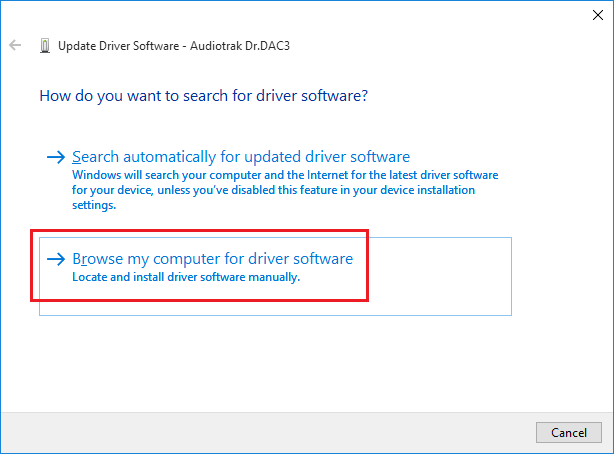 In Windows 10, make a manual installation of DR.DAC3 Driver in the following ways. 1. Unzip attached the 'DAC3_driver.zip' file. 2. Windows 10 -> Start -> Right Click -> ‘Device Manager’ -> Click. 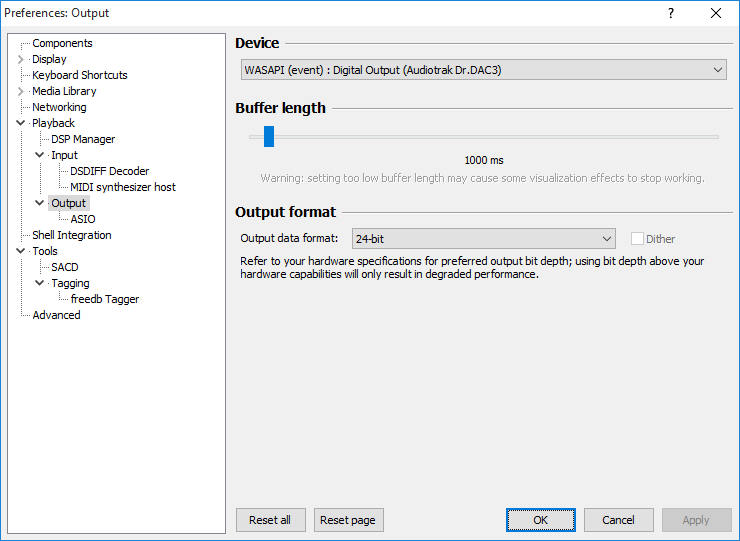 If you connect DR.DAC3 to a PC USB, it will be displayed in the 'Other devices' of Device Manager. 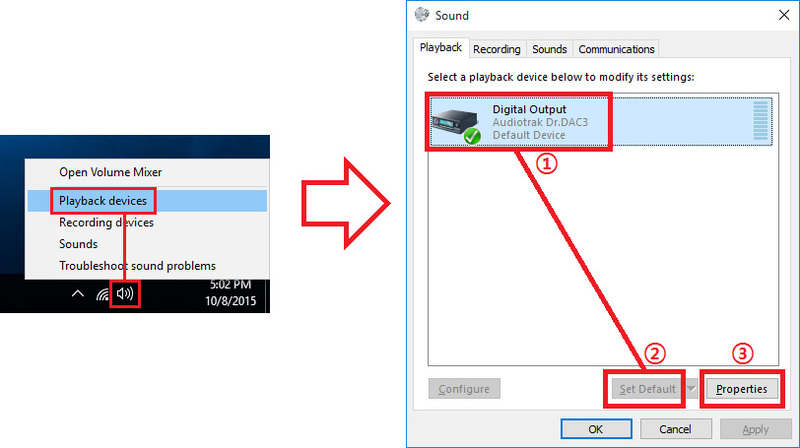 ‘Audiotrak Dr.DAC3’ -> Right Click -> ‘Update Driver Software’ -> Click. 3. ‘Browse my computer for driver software’ -> Click. 4. Click 'Browse ...' to select the folder suitable for the version of Windows. Example) When it is a 64bit version of Windows, select the '64bit_driver' folder and press OK.
5. When Driver Installation is completed, click Close. 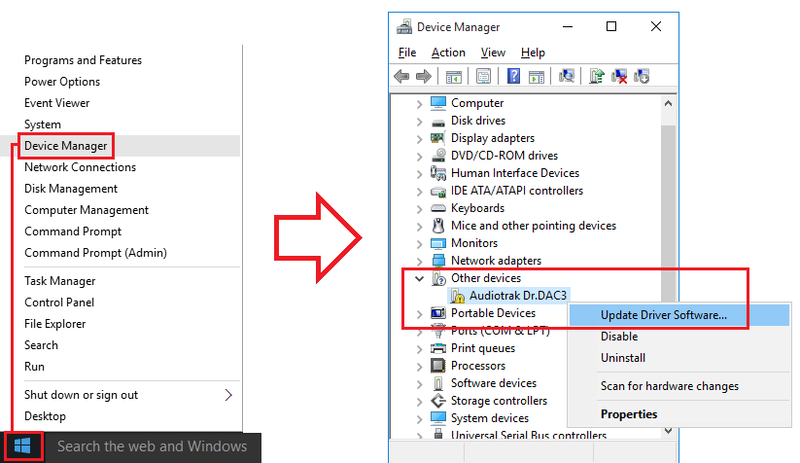 When 'Audiotrak Dr.DAC3' is properly displayed on Device Manager -> Sound, video and game controllers, it is ready to use. 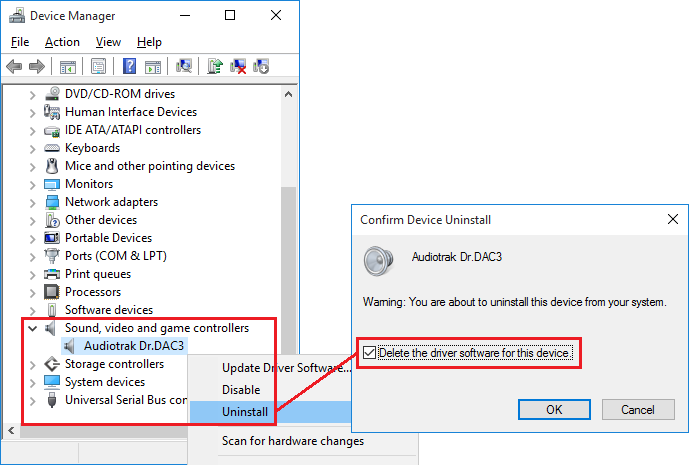 If you want to delete Driver, select Device Manager -> Sound, video and game controllers -> Audiotrak Dr.DAC3 -> Right Click -> ‘Uninstall’ Click -> ‘Delete the driver software for this device’ and click OK, then the installed driver will be deleted. 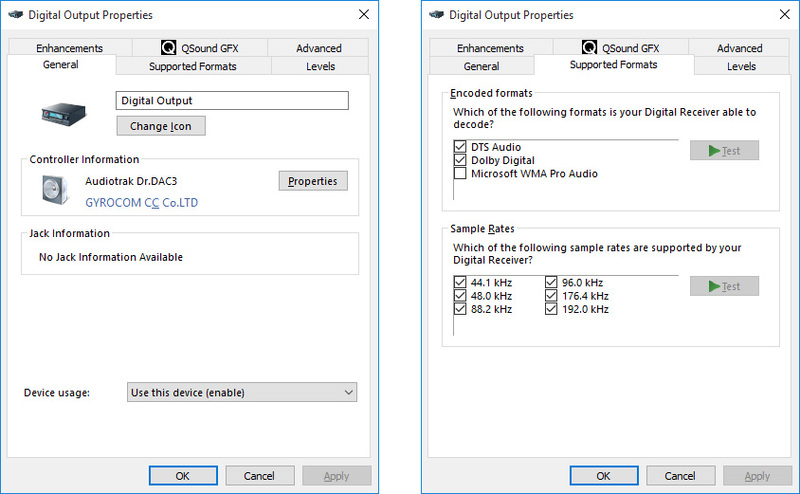 When installing drivers manually, you can control all the functions of DR.DAC3 in the Window sound setting tab. 1. In the controller tab of DR.DAC3, information on DR.DAC3 will be displayed . 2. 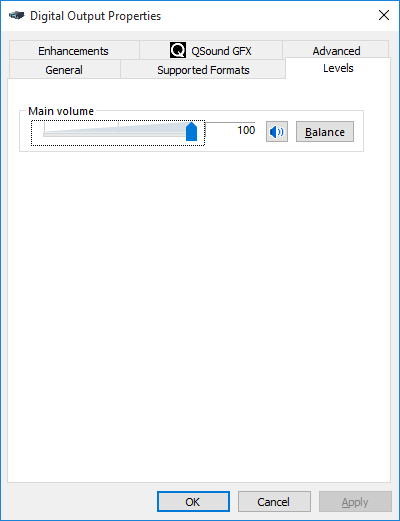 In the 'Supported Formats' tab, Optical Out can be set. – Encoded formats : Select the item to use Pass-through (DTS / Dolby Digital) functions. – Sample Rates : Select Sample Rates to be supported in Digital Receiver. 3. In the 'Levels' tab, you can use Volume Frequency Control. 4. 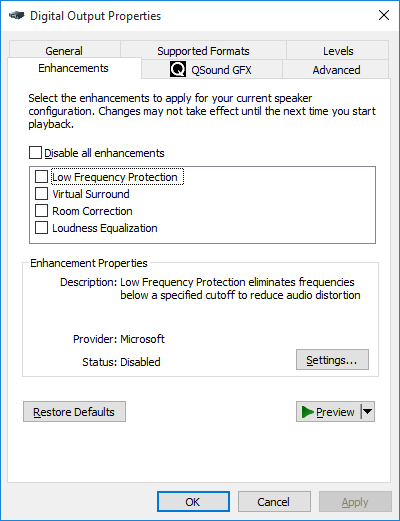 In the 'Enhancements' tab, you can use functions such as Low Protection. ※ It is a sonic benefit not to check Low Frequency Protection, Virtual Surround, Room Correction, Loudness Equalization, etc. 5. 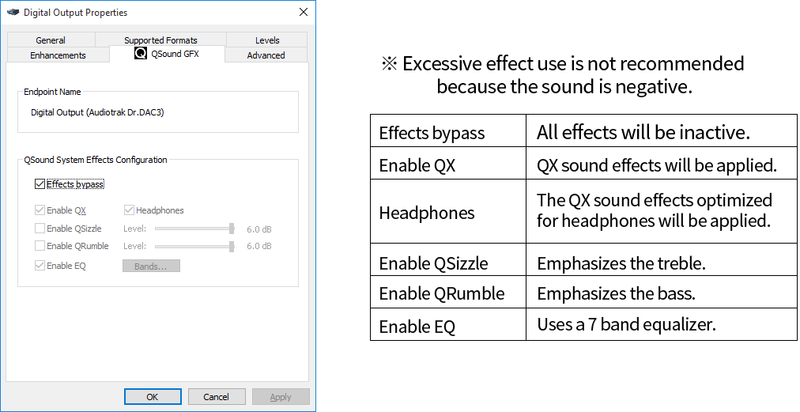 In the ‘QSound GFX’ tab, you can activate Q Sound Effects. 6. In the ‘Advanced’ tab, you can select Sample Rates to be used in the Shared Mode. When foobar2000 is first installed, Default Device is DS Mode (DirectSound Output). DS (DirectSound) Device allows simultaneous output with other players using the Shared Mode. 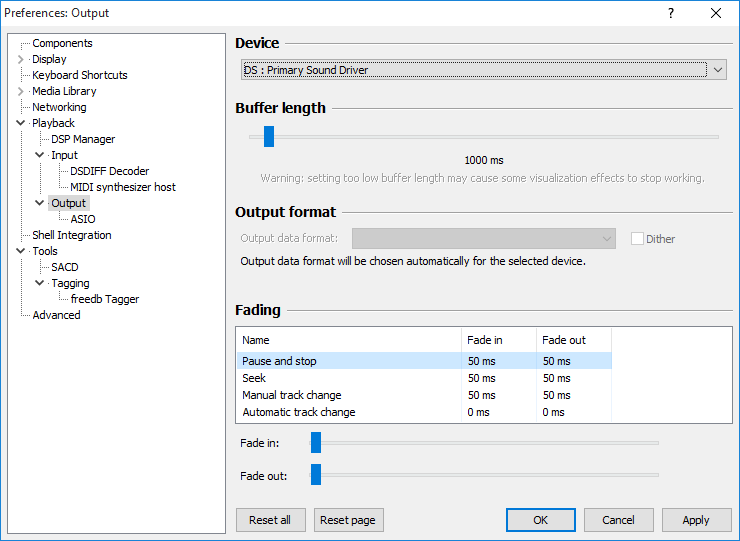 As a foobar2000 - WASAPI Mode, you can use the best sound quality during playback. If you want to use foobar2000 - WASAPI Mode, download and install WASAPI output component. If you download and install the 'ASIO4ALL' at the following link address, you can use the ASIO output from foobar2000, etc. and set to Device - ASIO : ASIO4ALL, you can use the ASIO output from DR.DAC3. 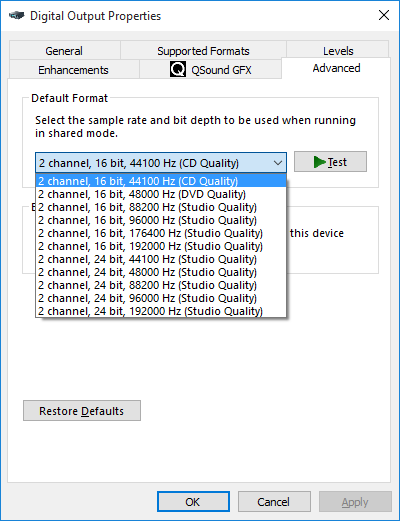 For using ASIO4ALL in DR.DAC3, if you apply as same as the following settings, in most cases, smooth playback in ASIO mode is possible without any problems. ※ The adjustment of ASIO Buffer Size and Latency Compensation may be required depending on the system.